“Oh my Gawd, it’s like an oven out here!” This is a not-uncommon refrain heard in Sacramento in summer. Well, if life gives you an oven, use it. This is one of the few places in the country where I can consistently dry things without an oven: Sacramento typically sees summer days over 95 degrees and humidity levels below 60 percent, sometimes way below 60 percent. Perfect for drying. Some things, like the porcini mushrooms I dried earlier this year, are easy. Slightly harder were the zucchini I’ve been drying lately; zukes have more water than mushrooms — and the more water something has, the more difficult it is to dry without getting it all moldy. Which brings me to tomatoes. Tomatoes, as anyone knows, have lots of water. Even the paste or processing tomatoes I use do. Forget about beefsteaks and most heirlooms, which, while tasty, have even more water in them than most maters. Getting 85-90 percent of that water out, which is what you need to properly preserve tomatoes (or anything, really) without cooking the tomato is tricky. Most recipes ask you to put the slices into a warm oven, but even a warm oven will be close to 200 degrees. Yes, you can put the oven on its lowest setting, keep it ajar and use a fan to blow air into it, but that is an awful lot of work. Once you get past 130 degrees or so, you are cooking the tomato, and this irrevocably changes the flavor. You will also begin to lose vitamins. A commercial dehydrator is another option, and I’d probably buy one if I lived in a wetter place. But I don’t. What I do have is the perfect natural dehydrator: My garage. 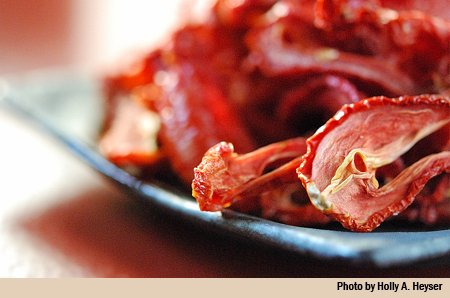 But Hank, these are not SUN dried tomatoes, then? No. No, they’re not. They’re better. Quick quiz: What does the sun do to colors? Time’s up. It bleaches them. 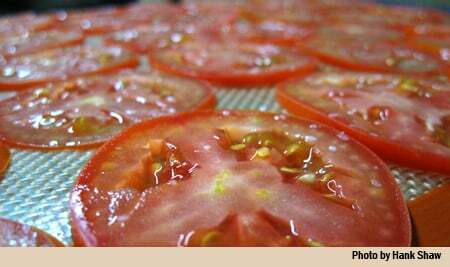 Even the powerful color of a tomato often will be bleached in the time it takes to dry it. The much-darker garage prevents that color loss and leaves me with those pretty tomatoes you see above. Getting this right isn’t as easy as skewering some tomatoes and hanging them haphazardly. I tried that, and was rewarded with a thriving colony of black mold. Big fail. Out $6 worth of tomatoes, I tried again. This time I added salt. Not good enough. I lost 80 percent of them to black mold. This is the trade-off I am making for better tomatoes. I could put them in the sun — or inside my truck, where it is even hotter — but then I run the risk of losing color and flavor. No mold issue, but an inferior dried tomato. Doing it in the garage takes 2-4 days, enough time for mold to grow. I sliced paste tomatoes (big Romas) lengthwise into pieces about 1/4 inch wide. I sprinkled salt down on cookie sheets and poured some red wine vinegar into a bowl. Each tomato slice got a quick bath in the vinegar — only a second or two — and then was placed on the salted cookie sheet. When each sheet filled up, I sprinkled more salt on top. I skewered the tomato slices and hung them to dry in the garage. Why skewers? Because you then have as little contact with a hard surface as possible, and everything that touches a hard surface can trap moisture and promote mold growth. Do not let the tomatoes touch each other when hanging. Check them every day. You can take them down when the tomatoes are dry but leathery — this is how I like them — or when fully crispy. The leathery tomatoes are perfect preserved underneath olive oil. They are a good antipasto all by themselves. The crispy ones can be tossed into soups or even powdered; powdered tomato makes a cool addition to a pasta dough. Is there another way to dry tomatoes? You bet. In fact, I just learned a new one in, of all things, a book that focuses on grilled meat. I received a review copy of Peter Kaminsky and Francis Mallmann’s Seven Fires: Grilling the Argentine Way, and while perusing it I noticed an unusual method for drying tomatoes: Slicing them very thin and drying them on Silpats, which you bakers know as the ultimate non-stick mat. This method requires neither vinegar nor salt, although I like a little salt tossed on for flavor. You do need a Silpat — otherwise good luck getting the dried slice off your cookie sheet — and a very sharp knife. This is the first of what I plan to be a series of tomato posts. Just like I have largely sworn off buying meat (with the occasional exception of John Bledsoe’s pork at the Davis Farmer’s Market), I am slowly stepping away from store-bought tomato products. I can dry my own tomatoes with the best of them, and I make a good base tomato sauce that I put up for the winter. I make tomato paste the Sicilian way; they call it estrattu. I’ll get to that in the coming days. I’m also messing around with some very old recipes I’ve found in a fascinating book called Preserving Food without Freezing or Canning. I’ll be back when I test them out. Be warned: Some are pretty freaky. Using your outstanding information and a method borrowed from Alton Brown of the Food Network, I dried my first harvest. Living in SW Arizona the temperatures get very warm which helped with the method but isn’t necessary. 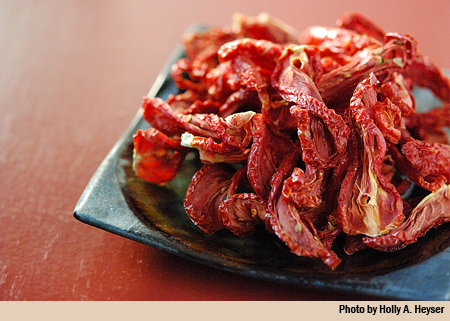 In only 48 hours I had beautifully dried tomatoes with no mold issues in a small space. Per Alton, use a 20″ square box fan, 20″ square non-fiberglass pleated AC/furnace filters, non-stick dehydrator mesh mats, and 2 bungee cords. Prepare tomatoes as you describe. Stack a filter, dryer mesh, tomatoes, dryer mesh, and filter. Repeat until you finish with a filter. Bungee to box fan and lay flat on it’s back on a suitable elevated surface like a milk crate or some cinder blocks. Set fan to medium speed and forget it for two days. Cooler areas may require high speed as it is the air passage and not the heat that dehydrates. I’m glad I stumbled onto your site. It has a lot of information I’ll be using in the future. in Spain, drying tomatoes and of the four trays done two developed white mould, other two perfect any suggestions? I’m drying a pound of san marzano’s in a dehydrator. Overnight they developed some white mold on a some. I guess they will be alright when they are completely dried. 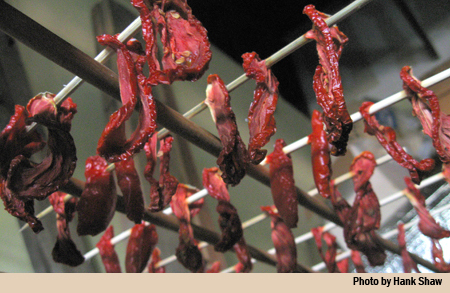 I put quartered Roma tomatoes on a jerky dehydrator try (stackable wire rack) and then placed that on my wood stove. I did dry what I thought was a large batch, (they reduced down to about half a pint). I covered in olive oil, heated it all in the oven at 200 then put the lid on to cool. Mostly an experiment, but they have been in the fridge for 2 months now and seem to be fine. I like to put them in tomato soup. I suppose I did change the flavors from the heat, but I don’t have those hot summers in North Dakota. The few I sampled before canning tasted great. I always hate buying anything I can make myself. Thanks for all the excellent information.